Yahoo News confirmed the award through the February 11 Ferguson City Council meeting minutes and photos Wilson’s father posted to his Facebook page. One image shows Wilson shaking hands and receiving the commendation from Ferguson Police Chief Thomas Jackson. In a second photo, the tall and slender Wilson brandishes smile as he returns to his seat with his honor. Yahoo News tried to reach John Wilson by phone late Friday. Tonya Wilson, his wife and the officer’s stepmother, answered and said “we’re not talking to anybody — thank you” before hanging up. A text message seeking the name of Wilson’s attorney wasn’t returned. On Friday, Chief Jackson told reporters that the young officer was taking the death of 18-year-old Michael Brown very hard. The officer’s modest ranch-style house in the Crestwood suburb southwest of downtown was quiet on Friday. Neighbors told reporters that the area had seen a heavy police presence all week and that Wilson apparently left a couple of days ago. 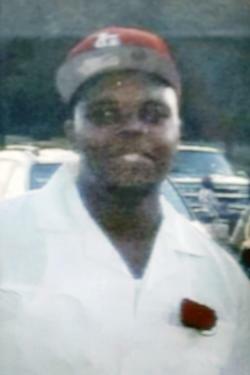 The Ferguson chief said Wilson has been placed on paid leave pending the outcome of multiple investigations into the shooting. Police said Brown, a recent high school graduate, was shot after Wilson encountered him and another man on the street during a routine patrol. The department says a skirmish ensued and that Brown physically assaulted Wilson and tried to take his weapon. According to a brief timeline given by Chief Jackson, the altercation lasted no more than three minutes before Wilson shot Brown multiple times. But Dorian Johnson, Brown’s friend, has told reporters that it was Wilson who was the aggressor and that Brown never went for the weapon. Instead, Johnson says Brown had his hands in the air and was pleading for Wilson not to shoot. The circumstances surrounding the shooting and the department’s delay in naming the officer fueled a week of turmoil in Ferguson and outcry across the nation. Jackson said he delayed identifying Wilson because the officer fears for his safety. “He has been an excellent officer for the police department,” Jackson said.